Fiddleheads are somewhat strange looking plants whose unraveling leaves resemble more than anything else the twisted head of a violin, hence their name. Immature leaves of members of the fern family, fiddleheads are common in watery or damp environments and are used as scenery in many caves. Like real-world ferns, fiddleheads reproduce via the release of spores rather than using pollen and seeds. This is never shown in-game, but Captain Olimar's notes mention it. 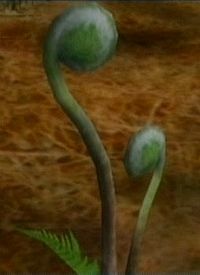 A Fiddlehead from the real world. This page was last edited on April 3, 2019, at 16:40.